You can set up a signature for your HubSpot user profile, which will be used for your emails sent through the CRM. Scroll down to the Signature section and click Edit signature. Enter your signature in the text box. Format the text, add links, or insert images using the icons in the Simple editor. Or, click HTML and edit the HTML of your signature. Please note: if you want to customize the font of your signature, you can do so in the HTML editor by adding the HTML <font> face attribute tag. 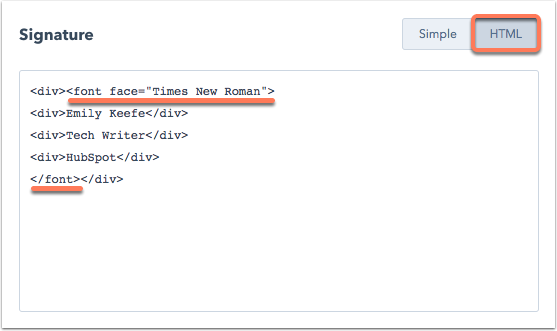 Learn more about the <font> face attribute. Keep in mind that many fonts may not be supported consistently across email clients.